Israeli soldiers shot, Monday, a Palestinian child, only six years of age, in her arm, after the soldiers invaded Silwan town, in occupied East Jerusalem, and fired many concussion grenades at homes. The soldiers also invaded a children’s center and searched it, causing many to suffer anxiety attacks. 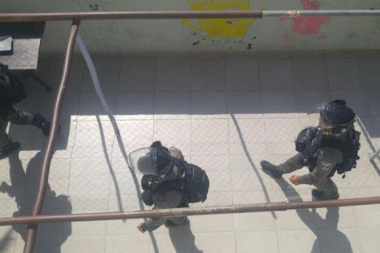 The Wadi Hilweh Information Center in Silwan (Silwanic) has reported that dozens of soldiers invaded Batn al-Hawa neighborhood, and randomly fired concussion grenades at homes. Silwanic added that one of the grenades smashed a window of one of the homes, causing a child, only six years of age, to suffer various cuts and bruises, especially in her shoulders. The soldiers also invaded Mada Creatively Center for children, in Batn al-Hawa, and violently searched it, causing many children, between the ages of five and fourteen, to suffer anxiety attacks. Fatima al-Abbassi, one of Mada’s employees, said at least thirty children were in the center, participating in various educational and recreational activities, when the soldiers invaded it.